Yep. THAT’S how you start a post with a bang. That delicious pile of meaty heaven (a pastrami reuben, by the way) is probably my favorite sandwich on the planet. And while I was all set to post a recipe today, after eating this sandwich yesterday, and seeing that ms. melba toast already had me in the meat mood, I decided it was time to share with you something very special… something that lawyers and politicians of Chicago drool over and the good Jewish folk of the North Side travel far just to eat. There is a place, kids, where dozens of cafeteria pans steam and bubble. Where piles of short ribs fall off the bone as they are spooned onto your plate. Where the heavy scent of potato pancakes wafts through the air. Where very old men bark at you for your order, but will slip you a sample of corned beef with a wink and a smile. There is a place where lines are long, people are hungry, and there isn’t a piece of pork in sight. That place, my children, is Manny’s Coffee Shop & Deli. Doesn’t look like much on the outside, but inside this little Jewish deli off Roosevelt Road should be a national treasure (actually, it’s known as one of President Obama’s favorite Chicago spots, so it very well could be soon). I was first taken there as a law clerk, and my first impression was one of a place where Important Things Happen. More often than not, you’ll see a dozen lawyers, half a dozen judges, and several city politicians chowing a corned beef sandwich at one of the tables in the huge dining room. Manny’s is cafeteria style, and thus a great equalizer– there is no special table, or special service; whether you’re the Mayor or a homeless guy with a spare few bucks, you are grabbing a tray and going through the line. And you better know what you want, despite the fact that the menu is not easy to figure out. But look down at the huge trays of steaming specials– beef stew, meatloaf, soups, and dear god, the shortribs– and just point. I’LL HAVE SOME OF THAT….AND A POTATO PANCAKE. If you go to Manny’s and dont get a potato pancake, you are both an amateur and a fool. Crispy on the outside, steamy and soft on the inside…good lord. Now personally, I always go for the reuben. And yes, I know this is traditionally made with corned beef. Calm yourselves. 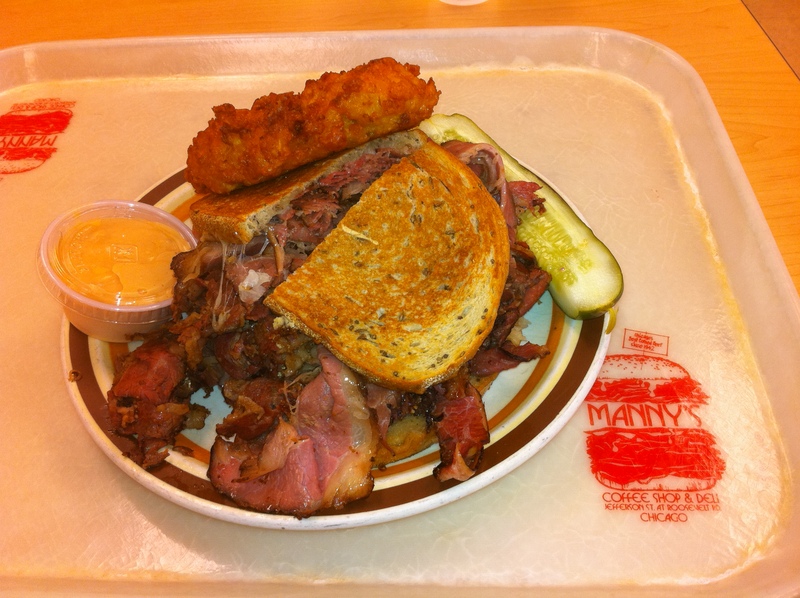 The corned beef at Manny’s is the best in the city, no doubt. But the pastrami? That is the stuff dreams are made of. It’s very similar to corned beef, but with extra steps to add a more pepper flavor and smoke. It’s tender, salty, and VERY peppery. Slap that on some rye bread with swiss and sauerkraut, with a side of thousand island? Do yourself a favor and scroll back up at that picture. Go ahead. LOOK AT THAT SANDWICH. First, it could feed a family of 4 – and it costs that much too– that sandwich, with potato pancake and pickles, was $15. WORTH EVERY FLIPPIN PENNY. I dare you to taste it and not love it. Seriously, I dare you. Any of you guys been to Manny’s? Thoughts? Agree with my worshipful review, or have a friendly criticism? Leave it in the comments. And as always, try not to drool on the keyboard. 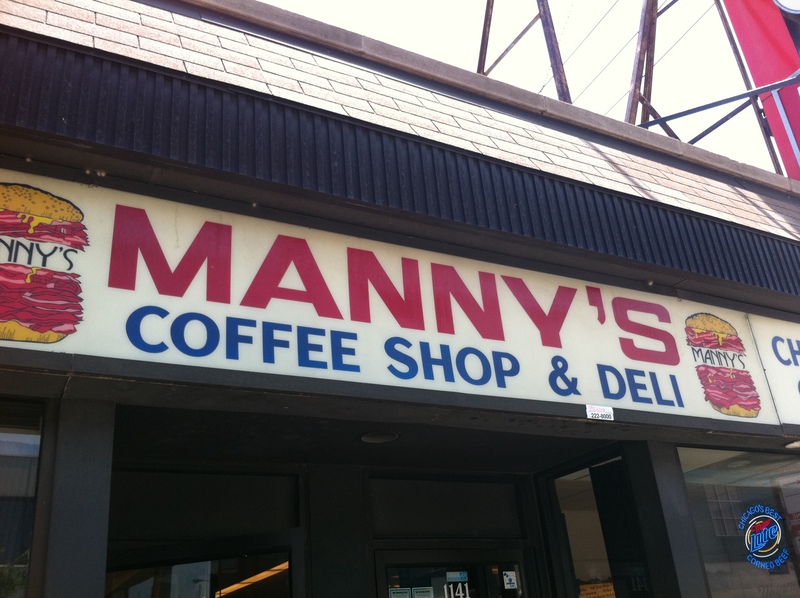 Manny’s Coffee Shop & Deli is located at 1141 S. Jefferson St. in Chicago, Illinois. And no, they didn’t pay me to write this post, but if they wanted to, I accept payment in lox. This is where I confess to having never been to Manny’s. I’ll rectify this immediately!